Shown are the three main structures deemed uninhabitable Tuesday afternoon by the City of Hillsboro. Editor’s note — This story has been updated to reflect that the buildings mentioned were deemed uninhabitable rather than condemned. According to the Hillsboro code enforcement director, the terms are similar but the legal definitions are different. A huge swath of buildings along West Main Street in Hillsboro, all but one owned by Jack Hope, have been deemed uninhabitable, according to the city’s code enforcement director. 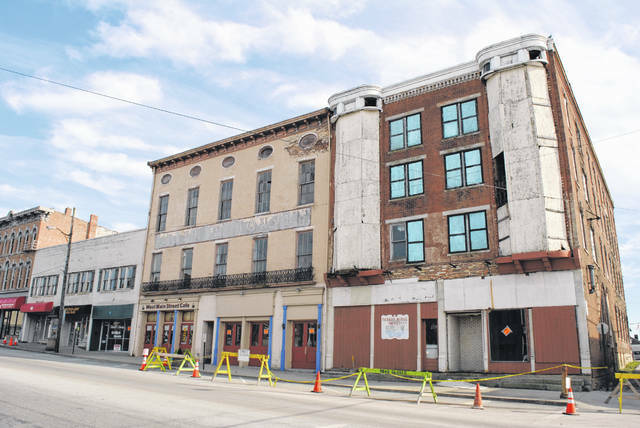 Anton Weissman, the city’s code enforcement director and zoning officer, told The Times-Gazette that the city had deemed each building from the old Parker House all the way to a AAA office on West Main Street, all owned by Hope, uninhabitable. Weissman said 119 W. Main St., an unoccupied building a few doors east, was also deemed uninhabitable. According to the Highland County Auditor’s Office, that building is owned by the Steven Fettro family. Orange signs posted in the windows of the buildings said the structures were not fit for occupancy and warned onlookers to stay back to avoid falling debris. According to Weissman, Hope has up to 30 days to do so, and if he does not, the city will file for an injunction to demolish the buildings. Weissman said the city is assisting the two active tenants of the buildings — Momma’s West Main Cafe and the AAA office — with finding new locations. Hope could not immediately be reached for comment. The city and Hope have been in an ongoing struggle to address the condition of at least the old Parker House for a number of years. Tuesday evening, Mayor Drew Hastings said he was set for a meeting with a member of Hope’s family to discuss the Parker House Wednesday morning, but said he was not aware the buildings had been deemed uninhabitable. Safety and Service Director Mel McKenzie said he, too, was unaware, but that he was not surprised. Hastings said Weissman and McKenzie had looked at the inside of the buildings last week. McKenzie told The Times-Gazette that they were in poor condition. According to Hastings, there is a 2016 report detailing the condition of the Hope buildings, but he declined to comment on the report’s findings. Hastings’ term as mayor ends in December 2019. Hastings said in June last year that he had told Hope about the city’s blight abatement program, which allows residents to pay for property demolition via property tax assessments, but that Hope at the time said he wasn’t interested. Two years ago, a building behind the Parker House was torn down after a portion of its rear wall collapsed, reigniting discussion of Hope’s buildings. In 2015, the city took Hope to court for failing to register the Parker House Hotel as vacant property. Hope challenged the constitutionality of the ordinance, and the case was ultimately dismissed. In 2008, the city and Hope were at odds over permitting inspections at various properties along West Main Street owned by Hope, particularly the Parker House. Then-safety and service director Ralph Holt said at the time, “We need to get it resolved one way or another. (The engineers) can look to see what Jack can do to either fix it, demo it, and the cost would be something he could absorb,” according to a Times-Gazette article. Shortly thereafter, the city erected a chain-link fence on the sidewalk in front of the Parker House, claiming the building was unstable. But Hope’s battles with city leaders go back to the 1980s, when he first purchased the Parker Hotel and Parker House, along with other adjacent buildings housing various retail businesses and restaurants such as the former Magee’s. A summation of the chapter states that after Hope and a partner “purchased and restored several buildings and formed an organization to develop it into an attractive and viable modern showplace and commerce center, the program was undone by the resistance of certain local interests.” Hope is particularly critical of Hillsboro bankers at the time who did not get on board with his project. “As predicted in 1985, the abandonment of downtown Hillsboro by the banks has led to major changes in the city,” Hope writes in his book, adding that most new development ended up happening on the north side of town, with new school facilities built south of town.